I do love Christmas food. Turkey, beef, the spices, cranberries, nuts and all... We hosted Christmas this year so we had plenty of leftovers, even after sharing some out, so I have been getting some lovely flavours in my tummy this whole holiday period. But as it can get a bit samey eating the same food for several days in a row I thought I'd share a little recipe for Christmas leftovers we tried today. An Asian-inspired warm salad, which we served in tortillas as a wrap - it was seriously yummy, Christmassy and something new for our turkey-stuffed taste buds. We used the leftovers of a rib of beef (originally cooked medium rare) but you could also use turkey or gammon. Otherwise the recipe calls for lots of other things that are left over from traditional Christmas dinners, like clementines, pomegranates, cranberries and nuts, and all the extra you need is some fresh herbs and salad. We served this in tortilla wraps, but you could also serve it as a warm salad. First make the dressing. Fry shallots on a pan, on medium heat with a splash of olive oil. Once they are softened and lightly browned, put them on the side to cool. Then combine the rest of the dressing ingredients in a bowl, and mix with a fork. Mix in the shallots once they are cooled. Now the salad: Heat a large pan on a high heat, once hot add a glug of olive oil, toss in the meat with the nuts, cranberries and the allspice. Make sure that's nicely combined and let that fry for around 5 minutes, tossing it every once in a while so nothing sticks. After about 5 minutes, add honey. Keep tossing the mix occasionally. While that is cooking, get a large salad bowl, toss in your salad leaves, with mint and coriander leaves and the chopped chili, mix, put half the dressing in, combine well with your hands. The beef mix is ready after about 8-10 minutes of cooking, you're looking for a crisp outside to the beef and nuts to be nice and toasted. Put the meat on the salad, drizzle with the rest of the dressing and serve with some warm tortillas. Yum! Quite simple, gets rid of a few leftovers and is so damn tasty it is amazing! 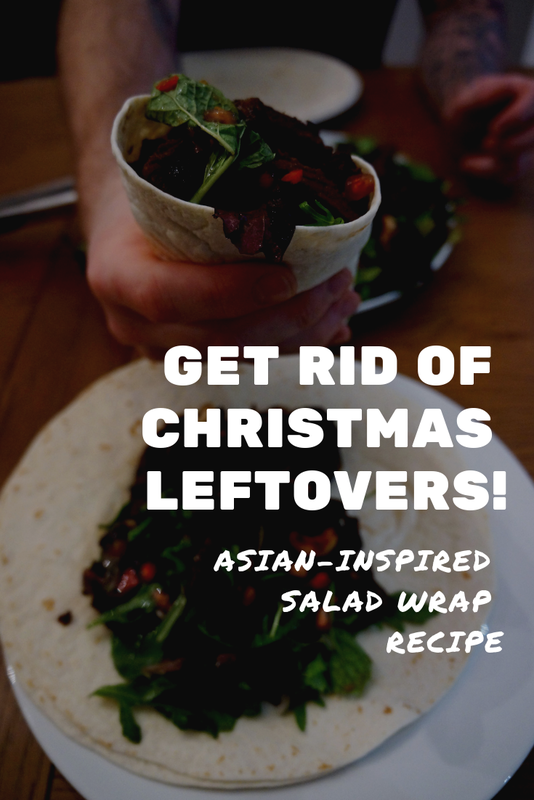 Do you have any other good Christmas leftover recipes? This was - and it isn't in any way Christmassy, even though a lot of the glavours come from leftovers, so definitely something you can have at other times of the year too!